What is 9 roasted bamboo salt? 9 roasted bamboo salt also known as purple bamboo salt. It is the highest grade of organic Korean bamboo salt. The bamboo salt is made following Korean traditional method. The sun-dried sea salt is filled into the bamboo trunk, secondly sealing the bamboo opening with red clay and finally undergo repeated the high-temperature baking process. At the ninth roasting, the baking temperature is increased up to 1500°C. Astonishingly, the white-greyish bamboo salt is turning into the purple color. The changing of color into the purple is due to the change of molecular arrangement of sulphurs. 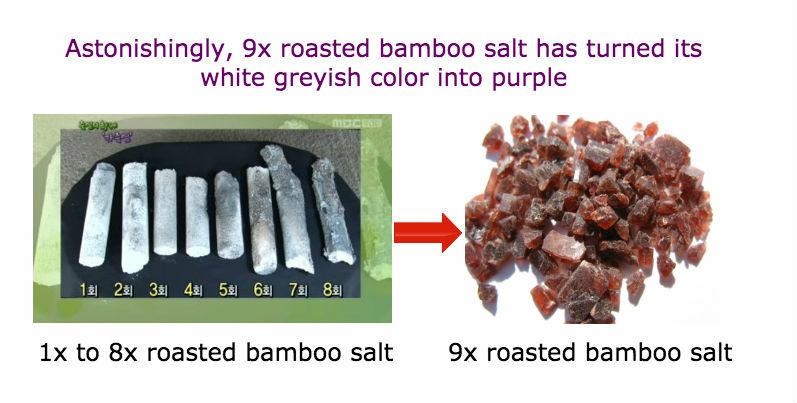 In ancient time, the change of color in 9x roasted bamboo salt is believed as a process of conservation of higher healing energy (refer to the manufacturing process of bamboo salt). The studies have found that bamboo salt, from its production till the selection of their raw materials, is guided by the principle of returning to nature throughout and run through the “heaven, Earth and human-in-one” oriental philosophy. The ancient oriental theory of “Yin & Yang” and “Five Elements, has adequately embodied in the process of bamboo salt production. In fact, the theory of five elements of Yin and Yang is true and meaningful even from the viewpoint of science. Everything in this world is formed by “metal, wood, water, fire and earth”, these five elements, furthermore they constitute the material world. Therefore, it is very natural to explain that these five elements are complimentary to one another. The theory of the five elements within nine times roasted bamboo salt. Metal: sea salt consists of the western qualities of metal. Water: bamboo, sea salt and red clay, three of them consist of the northern qualities of water. With the combination of the East, South, West, North, center, and its special method of production, proceeded in a tranquil, peaceful and serene forest by rivulets and mountains, bamboo salt can be said to be a substantial unique food for human being. With the combination of the East, South, West, North, center, and its special method of production proceeded in a tranquil, peaceful and serene forest by rivulets and mountains, amethyst bamboo salt (9x) can be said to be an ultimate unique food for human being. • The forest (on behalf of pine and bamboo): contains the spirit of heaven and earth and take the glitter of the Sun and the Moon. When the sky glistens with stars, green grass lays the back on the field. Who is the one? Who dares imagine to put the marine, the land, the forest and the rules of “five elements of yin and yang” together in order to obtain mutual penetration, mutual complement, and mutual enrichment until mutual balance, so that to create a new special type of food – bamboo salt? Only oriental does, especially the oriental who possess ancient wisdom. The birth of 9x korean bamboo salt is dependent on an imaginative combination of raw materials, it is definitely not a simple enumeration like 1+1 = 2, but it comes with a profound feeling of certainty on the nature of life, is also things in this material world re-exists under the tension of the five elements of Yin and Yang. This is only a part of the miracle, in order to become a true kind of high-energy material, it is also necessary to choose a particular way to amalgamate all these organic materials. In the process of amalgamation, it is essential to achieve the reciprocity in both insufficiencies and combine the strong points until the formation of perfection. In this point, there is a basic distinction between the simple enumeration like 1+1=1and the technique refined by a single or several substances by rote. Its energy, efficacy is 1 +1 ≥ 2. In that case, what is used for penetration? What is used for the combination? It’s fire! Take the Chinese word “烤” apart. The word <<火>>, “fire” adds on the word <<考>>, “test” aside, that is the formation of <<烤>>, “roasting”. It means that after the combustion, fire and the substances-being-burned can perfectly be combined. Fire is the best carrier to transform something rotten into something wonderful. This is the most scientific method to enhance the qualities of all materials and change their natures through pyrogenation at high temperature. In the “Compendium of Materia Medica”, Chinese renowned medical scientists Li Shi Zhen once mentioned that salt should best be roasted before use. In what reason that salt should be roasted before use? Moderns nowadays are completely unable to understand the wisdom of the ancients. Reputedly, salt was non-toxic at that time, therefore, there weren’t any contamination’s problems. But why did the ancients roast the salt unnecessarily? The answer is simple in fact: roasting and heating up salt are not merely to remove contamination, also to strengthen energy; it is not only for daily diet, also used as emergency medicine. In other words, the common salt will produce the nature of drugs after being roasted. This is a great discovery of our ancients. This simple method of transforming the generality normal salt to miracle 9x roasted purple bamboo salt reflects the wisdom of our ancestors fair and square. What is fire after all? In the eyes of the ancients, fire is only a kind of gas but isn’t a texture indeed. Fire is formed by the heaven and the earth, can destroy everything on the land. It still consists of wizardly unlimited uses. Now, in the scientific point of view, fire is a kind of energy. It can change the nature of materials once the objects are burned; fire can destroy thousands of lives meanwhile give birth to new lives; fire can transform energy, remove and release energy. Why do we use pinewood fire in the making of 9 times roasted bamboo salt? Pine tree grows tall and mighty, is an evergreen plant. It not only possesses the nature of wood but also consists of vigorous and immortal vitality. The bark of pine is thick and rich in resin. Even if it is burned by fire at high temperature, it keeps its warmth everlastingly. A deal of efficacy is found in bamboo salt, for instance: getting rid of the old cells and promoting the new cells, promoting metabolism, giving an amazing restorative capacity, high-energy, super-vitality… …and so on. All of these characteristics are originally from the power of pines. Why is 9 times roasted bamboo salt able to exert a miraculous effect on any physiques, any toxins, and any modern diseases? Is it because bamboo salt has attentively reunited the ancient oriental wisdom and charm? It is so far a mystery. 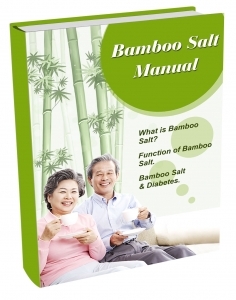 Bamboo salt is active, high-energy, not harmful to a human body and non-toxic side effects. It is profound, simple, wisdom hidden. Bamboo salt flickers the light of the wisdom of the East and comes with an extremely special miraculous effect. 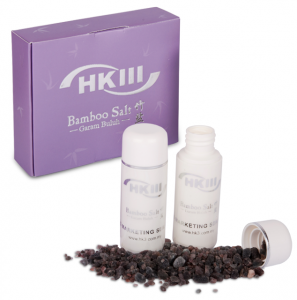 HKIII has many user feedback regarding the health improvement after using 9 times roasted bamboo salt. The most significant result arises from the cancer patient. According to Noble Prize winner, Dr. Otto Warburg, cancer cells can’t survive in alkaline environment. Nine times roasted bamboo salt is one of the most alkaline food in the world, its pH level achieves pH12.35. By consuming 30 granules a day, it was reported that the cancer cell level dropped significantly after 2 weeks. We suggest cancer patient contact our nutritionist or dietitian at +60197161678 or hk3@hk3.com.my for individualized health management plan. Are salt and sodium chloride the same things? I have a stage four metastatic breast cancer, So I think this salt would possibly be very good for me. But I don’t understand using a salt on cooked food that would raise pH, since i’ve read that hydrochloric acid shouldn’t be diluted while eating because you need an acid environment (ph acidic) to digest food . Then you drink, etc things that are going to raise your pH between meals. At least that’s my understanding. What do you think ? Your help will be much appreciated. Also I’m not sure about How to use the salt because this is just big chunks and how do you use that on food, or how else are you supposed to use it ?